At Movassaghi Plastic Surgery, we make safe, long-lasting hair removal possible for nearly anyone! Most of us have unwanted hair, but shaving can be time-consuming and even leave painful bumps and rashes. Waxing is a longer-lasting alternative, but it too can be unpleasant and messy—and you have to repeat the task every month or so. There’s a better solution: laser hair removal. By destroying the hair follicle with a highly focused beam of energy, laser hair removal ensures the hair won’t grow back, leaving your skin smooth and hair-free, day in and day out for years to come. Our favorite technology for laser hair removal at Movassaghi Plastic Surgery is Clarity™ by Lutronic. 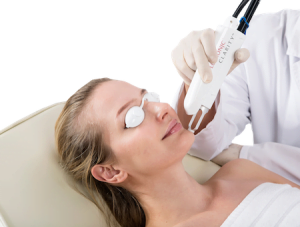 It’s a “dual wavelength” laser, including both a long-pulsed 755nm Alexandrite and 1064nm Nd:YAG, which is especially well-suited to darker skin. We can adjust the amount of each wavelength for your skin type and hair color to effectively destroy the hair follicle while minimizing risk of discoloration or skin damage. In our experience, Clarity can get results for patients who’ve not had luck with other lasers. If you’ve previously been told that you are not an ideal candidate for laser hair removal, or you’ve tried other treatments with little to no results, we encourage you talk to us about Clarity. Laser hair removal is a multi-treatment procedure. Each treatment targets hairs in the optimal phase of the growth cycle, helping to destroy the hair follicle and leaving skin smoother and free of hair with each consecutive treatment. While older lasers often require 5 to 7 treatments (or more), our Eugene laser hair removal patients are consistently satisfied with their results after as few as 3 or 4 treatments with Clarity. Clarity also has a built-in cooling mechanism that instantly dissipates heat after each pulse, protecting your skin and keeping you comfortable. We can complete each treatment much faster too, thanks to a large spot-size and quick pulse technology. Where on my body can I get laser hair removal? You don’t have to live with unwanted hair. Just think: if you get started on your laser hair removal treatments today, you could be free of the hassle of shaving or waxing those troublesome areas in a few short months. To book your appointment with our experienced laser and skincare professionals at Movassaghi Plastic Surgery in Eugene, call 541-686-8700 or contact us today.